In NeuroLab by CoolTool, the emotion measurement tool was always integrated directly into a professional survey, enabling researchers to obtain better insights and now you can measure emotions in browser as well. 2. You can carry out emotion measurement using mobile devices. 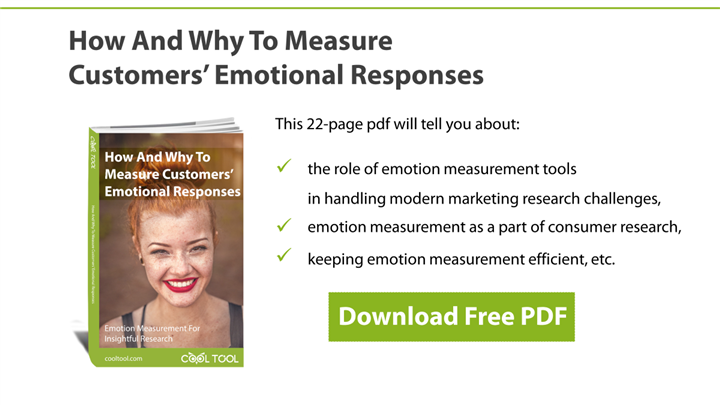 Conduct emotion measurement tests twice as fast without an application: just create a survey, upload the required materials and proceed to data collecting. • subscribers in the social media. What are the main benefits for respondents, agencies, and clients? For respondents: they can complete tests from both a mobile device or a laptop wherever they want. For agencies: it’s easier to reach out to respondents as well as collect the data faster, as there is no need for them to install the application. For clients: benefit from more accurate research data, as respondents complete surveys not in laboratories but in settings which are ordinary for them – in places where they come across standard advertising as well. Furthermore, this technology is currently free of charge for you. No Neurolab credits (conventional units of accounting for the number of projects implemented with the application of neuromarketing technologies) will be charged from your CoolTool account. Emotion measurement with the application of Neurolab app will be also available and relevant fees will be charged in accordance with your subscription plan. Currently, this tool is compatible with the following internet browsers: Chrome, Opera, Microsoft Edge and Firefox. • the face of the respondent should be located in the center of the frame. Our developers will continue working in this direction, aiming at presenting a full-fledged eye tracking tool for browsers in the nearest future. Are you interested in neuromarketing? We'd like to occasionally share some interesting insights with you. Are you interested in neuromarketing? We'd like to occasionally share some interesting insights with you. data to the third parties. What is Unconscious Insight in Marketing?